Sign Up Now for Pre Launch Offers! Why Exclusive Ventures when you have Magic Bricks and 99 Acres?! The difference is that Exclusive Ventures bring special early rate plot layout offers, helping members to book at LOW RATE, before the project is opened for booking in the open market. This ensures members get appreciation, quickly, with respect to their booking rate compared to the formal launch rate. 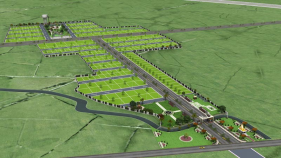 We publish only recommended plot layout projects in Hyderabad at very early investment stage. BOOKINGS WILL BE CLOSED as soon as prelaunch taregt is met. Usually only our MEMBERS who get alerted are only able to book. These uniquely located projects help you to get very good investment appreciation, especially since booking is done at early offer rate. There are hundreds of projects, but we pick up at the most 4 or 5 in a YEAR. Signup Now to get alerted! Join as Investor in the project. Get developed plots in liue of investment in Land. Location beside Highway (between ORR & RRR) near a town on the verge of sharp price increase due to Govt infra developments. 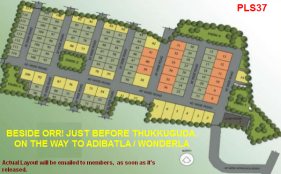 HMDA Residential Plot Layout - Pre Launch Investment is Open! Check Opportunity Available or Not The Project participation is by INVITE only to our long standing members. Few of the old Prelaunches at very low rate. 17.02.19 Telangana Real Estate Investors get 2 More District Headquarters to Invest in! Narayanpet and Mulugu! 10.02.19 Hyderabad to have yet another Master Plan! ASCI to undertake study and come up with a brand new plan. How to get early rate booking offers? If you are a member, you will receive alert email (we do NOT call anyone ever), about upcoming offer. The offers at special rate is usually picked up, within weeks, by members and booking closed. Contact us immediately, on receiving alert, if you are interested. All offers may not be open to all. In certain cases, we limit bookings to only members, who have booked in previous projects, due to lack of enough number of units, at special rate. We will be presenting Recommended Plot Projects in Hyderabad, here, as and when we approve them. To avail the base opening booking rate, it's important that you book plots early, before projects go into advanced construction. Get information on new, rich and luxurious properties for sale, in Hyderabad, Hitec City, Gachibowli, Outer Ring Road. Our Members will be alerted in advance, so that they can go ahead and book, at Pre Launch Prices. The superbly crafted service makes you empowered to take decision at your pace. No need to rush into high cost ventures on a visit to Hyderabad! Rather, get informed very early and join thousands of NRIs abroad who have made intelligent Real Estate investments in Hyderabad, riding on the power of early information! As usual early information would be supported by abundant details on price trends, future potential and drivers of growth, proposed third party and Govt. investments nearby, technical, regulatory, legal matters, comment on current demography, geography/possible changes, commercial and HUDA, HADA Maps for Hyderabad. SIGN UP, NOW! © CopyRight Reserved. 2019. Villas, Bungalows, Apartments, Plots, Hyderabad Villas, Properties for Sale in Hyderabad. You need to revert, as soon a project offer is published, since available units at offer rate, will be few. As soon as you receive offers, review and revert to us with your interest.